We spent the first 3/4 of our day at the Tulalip Outlets and shopped our hearts out. I tried my best to behave and not spend too much money like a crazed shopaholic, but Daniel was not being the best influence. Of course with my self-control, I couldn’t resist. I have now welcomed a new Kate Spade purse, some MAC makeup, a shirt or two, as well as some Adidas all-white sneakers to my closet. The traffic in Seattle is crazy. Going in or out of the city you are stuck in what seems like endless amounts of bumper-to-bumper traffic. Since we kinda messed up and left the outlets right in the middle of rush hour, we decided to stop and get some food on our way in. We stumbled upon an Olive Garden, and I was excited to try it for the first time. The food (and especially the breadsticks) are over-hyped and nothing special. Obviously ended up eating way too much. Driving in a new city is always intimidating, but driving in a new city, in the dark with misty-rain is even more challenging. What the heck is misty-rain you ask? It’s many tiny raindrops all blowing down at the same time, blocking your windshield from being able to wipe them away. Leaving you pretty much blurry and blind. Yes, it was a real struggle. 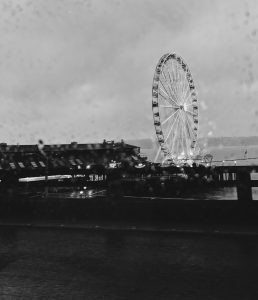 While weaving in and out of what felt like 10 different tunnels, 5 overpasses, and 2 wrong turns, I snapped a pic of the iconic Seattle Great Wheel (I didn’t know it was called that, I thought it had a cooler name), then finally arrived at our Airbnb. This picture greatly depicts our first night, rainy & grey with a blur of something cool. Day 2 was more relaxed. I must say that it is very expensive and challenging to find long-term parking in Seattle’s downtown area. We were staying in Pioneer Square, and our Airbnb host did not tell us that parking was not included with her apartment, so we were struggling to find affordable parking for the next two days. In the end, we paid around $45 to park the car in a safe parkade with a security guard to ease my worrying. Would recommend Ubering around Seattle instead of trying to drive and pay ridiculous parking prices! We went to Pike Place Market, and it was my second time there. I was amazed by the beautiful flower arrangements they had laid out at the stands. 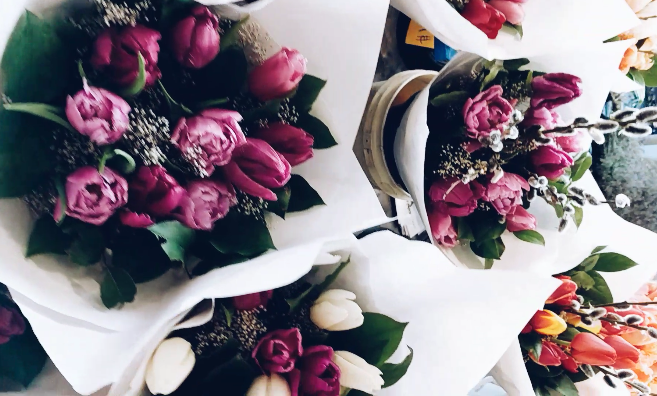 I obsess over photographing flowers and being mesmerized by their beauty. We had both already been to the market, so we didn’t spend too much time there, just quickly browsed the shops and moved on. Days away from Valentine’s Day, with my love leaving the country, we planned on having an early Valentine’s Day celebration dinner. 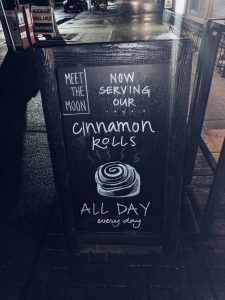 We decided on this small restaurant on the other side of the city, called Meet the Moon, with a beautiful view of the water and Bellevue’s skyline. Our Uber driver raved about Bellevue and it’s quaint characteristics and recommended we check it out. Our candlelit dinner was very romantic and the food was delicious. Daniel and I almost completely overindulged by getting one apple crumble dessert for there, and were so close to bringing a delicious cinnamon bun back to our apartment for later hehe. This sign just made the cinnamon buns sound way too enticing. LUCKILY, we had enough willpower to say that no, two desserts in one night is too much hahaha. None of the days we allowed ourselves to sleep in, so we were kinda tired by the end. (Yes laying around watching movies, and exploring the city are tiring tasks). 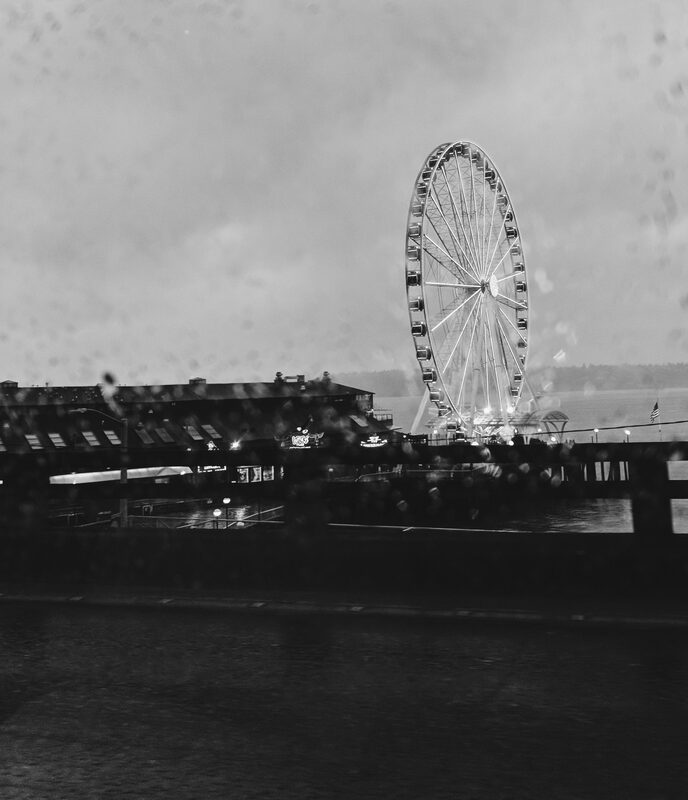 We decided to take the Uber driver’s advice and check out Bellevue for our last day. Earl’s has a restaurant in Bellevue so we went there for brunch since it was a quick, easy choice on our way over. Bellevue is much different than Seattle. It looks newer city with more modern architecture. I also loved that it was sunny out again yay! The sun tricked me though and I didn’t wear my parka. We wanted to walk around to explore but I’m a baby and it was too cold for me so we didn’t. We headed back a little earlier than originally planned because we wanted to beat the traffic back. To be honest, we wanted to go on a hike (well I did really badly) but it was our friend’s birthday party that night, and we didn’t want to miss it.